It’s difficult to say exactly which Native American groups were in this area in centuries past because the natives of the prairies did not build permanent settlements. About two hundred years ago, groups that now call themselves Wichita ranged through this area. Allied with them, perhaps related to them, were local groups called Waco and Tawakoni people who are today affiliated with the Wichita tribe. The city of Waco was named for the Waco people, and it lies at the southern extent of these groups. Lake Tawakoni, east of Dallas, and the little town of Tehuacana, south of Corsicana, are both named for the Tawakoni people. ‘Waxahachie’ is also a native word, but it’s not clear if it’s from the Wichita or perhaps from the Alabama people who came to Texas in the late 1700s and who have a very similar word. 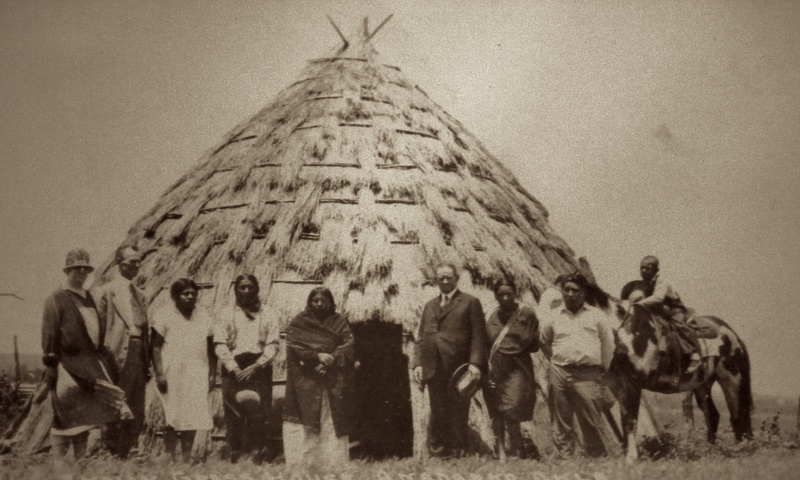 Wichita, Tawakoni, and Waco people built houses in a distinctive shape like a beehive, with a frame of branches covered by prairie grasses. In the summer they built open brush shelters that allowed the prairie winds to flow through them. They moved seasonally and had to cope with attacks by other native groups including the tribes we’ve come to call Comanche and Apache. We sometimes think of the Comanche people as living on the plains west of the Wichita, and the Apache in the desert west of them, but the truth is that all of the plains natives ranged very broadly and their circuits intersected each other. Plains tribes had acquired horses from the time of Spanish explorations, and some historians believe that the Comanche’s remarkable equestrian skills had given them an advantage over other tribes in the period before the European settlement of this area. One historian speaks of a Comanche “empire” on the prairies; perhaps an exaggeration, but a sign of the Comanche’s preeminence on the plains. Just before English-speaking settlers arrived in this area, other native groups had come here, forced from their native lands by the encroachment of Euro-American settlements. A remnant community of Cherokee people, for example, had traveled for decades from the Appalachian mountains through eastern Texas and lived near the forks of the Trinity around 1820.